JPSC 6th CCS Exam Revised Result 2017 Marks – Jharkhand 6th & 7th Preliminary Exam Result, Marks & OMR Sheet for Combined Civil Service (PT) Exam 2017 announced. 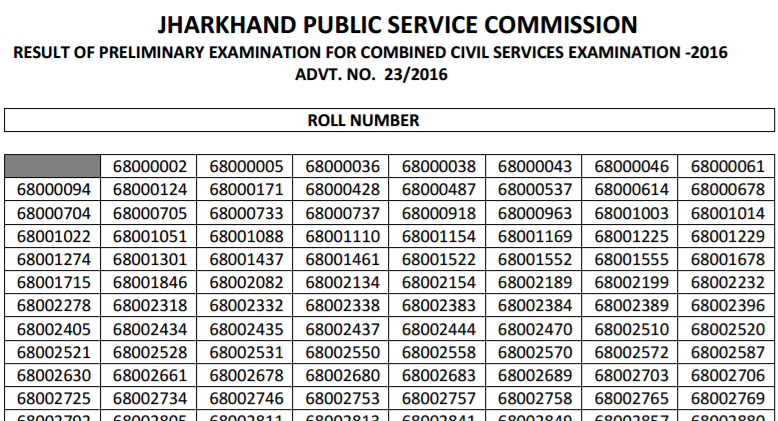 Jharkhand Public Service Commission (JPSC) has declared 6th Jharkhand PSC Combined Civil Service (PT) Examination 2016. They have already invited JPSC PT online applications candidates for filling up various vacancies. Written examination for JPSC Civil Services 2017 was held on 18th December 2016. They have now announced JPSC PT exam Result 2017. Candidate appeared in JPSC Civil Services exam can check their Marks and OMR Sheet at the link mentioned below. The wait is finally over. Result of preliminary examination for combined civil services examination 2016 has been declared and it is available for check. They have also published OMR Sheet of candidates appeared in JPSC exam along with Marks. All JPSC Pre exam aspirants can check their Marks below. JPSC PT Examination Date: 18 December 2016. When JPSC 6th PT Exam result will be out? This was questions JPSC Preliminary exam aspirants had in their mind since couple of days as they were asking for it regularly. Finally good news for them, JPSC officially released 6th PT examination Marks and OMR Sheet. As per the news, JPSC PT (Preliminary Test) examination revised result was announced today on 11th August 2017. Qualified Candidates are hereby recommended to keep preparing for JPSC Mains exam. Revised Result of JPSC Civil Services Exam 2016: 11-08-2017. More Details: Candidates are advised to be in touch with W3i.iN, we are here posting more detailed information about JPSC Jharkhand 6th Combined Civil Service (PT) Examination 2016.